When I first started getting into the world of beer, Stout was my favorite style. While looking up new Stouts to try, I kept running into massive praise for Brooklyn's Black Chocolate Stout, but it simply wasn't available in the Houston area. Much to my surprise, Brooklyn beers started showing up here a few months ago. Unfortunately, Black Chocolate Stout was not amongst the few varieties that made it down here in the first wave. What did make it's way down was their India Pale Ale, Brown Ale, Lager, and Local 1 (a Belgian Strong Pale Ale). As IPAs are one of my favorite styles, I decided to start with their attempt. After so much waiting, this is the first Brooklyn beer I've had the pleasure to try, and I'm very much looking forward to diving in. But first, perhaps we should pay attention to the beer at hand. 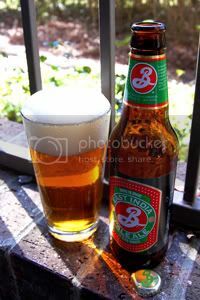 Brooklyn devised this beer in the more traditional English style of IPA, rather than the American style that dominates here today. Considerably more mellow than the hop-bombs we've started to crank out here in America during recent years, the English style is closer to what actually made it to India all those years ago, a hoppier and maltier version of the normal Pale Ale, designed to make the arduous journey without spoiling like a weaker beer. Brooklyn describe the beer as a "deep golden beer brewed from British malt and a blend of hops featuring the choice East Kent Golding variety. It is traditionally dry-hopped for a bright aroma of hops, lemongrass, pine and citrus fruit, and has a robust bitterness, a warming malt palate and a clean hoppy finish." Appearance: Crystal clear and bubbly pale golden-amber body. Pours a rather large and bubbly white head that quickly melts into a solid finger, leaving good lacing all the way down. Aroma: Sweet caramel malt with some clean, floral, and perfumey hops and some sweet fruit. A few notes of apple cider. It's all pleasant enough, but as this is an IPA, I was expecting a lot more from the hops. Taste: Grassy and bitter (not a normal hop bitterness) with a weird metallic taste. There's a solid lightly roasted malt backbone that tends to overshadow the hops, which is odd for an IPA. The alcohol is always present, I'd like to see it hidden a little better. To be frank, this is a confusing beer. Mouthfeel: A solid medium body with moderately-high carbonation. Drinkability: This would be quite sessionable, if it weren't for the alcohol being so prominent. Verdict: Seems much more like an English Pale Ale, than an English IPA, to me. Even then, there are a lot of problems with this beer. I'm not deterred in my quest to sample the rest of the Brooklyn line, but perhaps becoming a little anxious.